Viewed by over 100,000 potential customers per month, Amish America is one of the largest Amish-themed sites on the web. 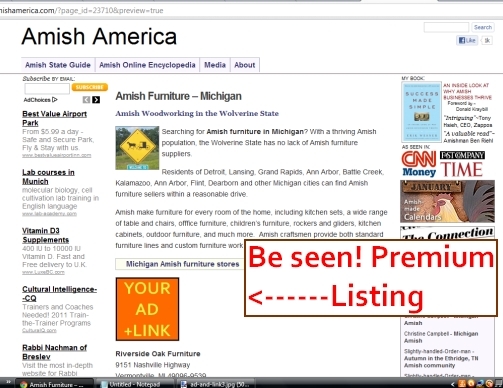 Short description of you business (what types of Amish furniture you sell, who builds your furniture, etc–up to 5 lines). Please include the word “furniture” in the subject line of your email. We reserve the right to edit all entries for space and clarity. Reach customers in your region with a targeted premium ad. How much is even one or two more customers per month worth to your business? The price for a premium listing is $99/month. Please email your premium listing request direct to Erik at ewesner@gmail.com.